"Table of Nations" redirects here. For a list of countries, see list of sovereign states. It lists Elisa as an extra son of Japheth, giving him eight instead of seven, while continuing to list him also as a son of Javan, as in the Masoretic text. Whereas the Hebrew text lists Shelah as the son of Arpachshad in the line of Shem, the Septuagint has a Cainan as the son of Arpachshad and father of Shelah – the Book of Jubilees gives considerable scope to this figure. Cainan appears again at the end of the list of the sons of Shem. Obal, Joktan's eighth son in the Masoretic text, does not appear. Shem's name means "name" or "fame". Through Eber he became the ancestor of Abraham and thus of the Israelites. In the view of some 17th-century European scholars (e.g., John Webb), the people of China, eastern Persia and "the Indias" descended from Shem. Both Webb and the French Jesuits belonging to the Figurist school (late 17th-early 18th century) went even further, identifying the legendary Emperor Yao of Chinese history with Noah himself. Ham is the forefather of Cush, Egypt, and Put, and of Canaan, whose lands include portions of Africa, Arabia, Syria-Palestine and Mesopotamia. The etymology of his name is uncertain; some scholars have linked it to terms connected with divinity, but a divine or semi-divine status for Ham is unlikely. Japheth is apparently the youngest son, although his line is given first. His name is associated with the mythological Greek Titan Iapetos, and his sons include Javan, the Greek-speaking cities of Ionia. In Genesis 9:27 it forms a pun with the Hebrew root ypt: "May God make room [the hiphil of the yph root] for Japheth, that he may live in Shem's tents and Canaan may be his slave." Ashur: "Assyrians, and their city Niniveh built by Ashur. Mesa (Mesh): "Mesaneans; it is now called Charax Spasinu". Gomer: the Cimmerians, a people from the northern Black Sea, made incursions into Anatolia in the eighth and early seventh centuries BCE before being confined to Cappadocia. Ashkenaz: A people of the Black and Caspian sea areas, much later associated with German and East European Jews. The Ashkuza, who lived on the upper Euphrates in Armenia expelled the Cimmerians from their territory, and in Jeremiah 51:27 were said to march against Babylon along with two other northern kingdoms. Riphath (Diphath in Chronicles): Josephus identification Riphath with the Paphlagonians of later antiquity, but this appears to have been no more than a guess; the Book of Jubilees identifies the name with the "Riphean Mountains", equated with the Causcasus in Classical sources, and the general understanding seems to have been invaders from the Causcuses who were settled in Armenia or Cappadocia. Togarmah: Associated with Anatolia in Ezekiel. Later Armenian historians claimed Togarmah as an ancestor. Magog: Associated in Ezekiel with Gog, a king of Lydia, and thereby with Anatolia. The first century CE Jewish historian Josephus stated that Magog was identical with the Scythians, but modern scholars are sceptical of this and place Magog simply somewhere in Anatolia. Madai: The Medes, from an area now in northwest Iran. Javan: This name is universally agreed to refer to the Ionians (Greeks) of the western and southern coast of Anatolia. Elishah: Possibly Elaioussa, an island off the coast of Cilicia, or an old name for the island of Cyprus. Tarshish (Tarshishah in Chronicles): Candidates include (Tartessos) in Spain and Tharros in Sardinia, both of which appear unlikely, and Tarsus in Cilicia, which appears more likely despite some linguistic difficulties. Kittim: Originally the inhabitants of Kition in Cyprus, later the entire island; in the Dead Sea Scrolls the Kittim appear to be the Romans. Dodanim (Rodanim in Chronicles): Inhabitants of Rhodes. Tubal: Tubal and Meshech always appear as a pair in the Old Testament. The name Tubal is connected with Tabal and Greek Tipaprivoi, a people of Cappadocia, in the north-east of Anatolia. Meshech: Mushki/Muski had its capital at Gordium and fused with the kingdom of Phrygia by the 8th century. Tiras: Josephus and late Rabbinical writers associated Tiras with Thrace, the part of Europe opposite Anatolia, but all the other sons of Japheth are located in Anatolia itself and it is possible that Tiras may refer to Thracians inhabiting westernmost Anatolia; it has also been associated with some of the Sea Peoples such as Tursha and Tyrrhenians, but this is considered unlikely. 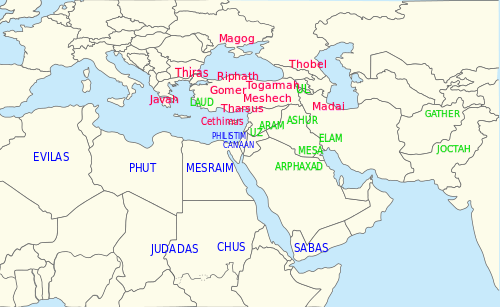 Cush: The biblical transliteration of the Egyptian name for Nubia or Ethiopia; the "sons of Cush" which follow are various locations on the Arabian and possibly African coasts bordering the Red Sea. Seba, son of Cush. Has been connected with both Yemen and Ethiopia, with much confusion with Sheba below. Nimrod: Possibly connected with Naram-Sin, a 3rd millennium king of Akkad;in verses 10–12 he is the founder of a list of Mesopotamian cities, and the biblical tradition elsewhere identifies him with northern Mesopotamia or Assyria. His location (Mesopotamia) is something of an anomaly, in that the other sons of Cush are connected with Africa or the Red Sea, and he is probably a late insertion resulting from a confusion between the African Cush and a quite different Cush, the eponym (ancestor) of the Kassites. Caphtorim: Probably the island of Crete. According to Deuteronomy 2:23, Caphtorim settled in Gaza, an important Philistinian city. 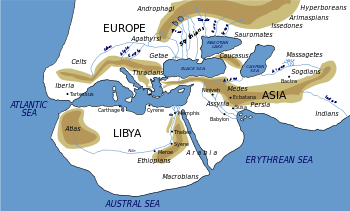 Phut: the Septuagint translates this as Libyans, which would be in accordance with the north–to–south progression in the listing of Ham's descendants, but some scholars have suggested Punt, the Egyptian name for Somalia. Canaan: The strip of land west of the Jordan River including modern Lebanon and parts of Syria, and the varied peoples who lived there. Sidon: The main Phoenician city, often treated as synonymous with Phoenicia. Heth: Probably the ancestor of the biblical Hittites, although the Hittites of Anatolia had no ethnic or linguistic ties with the peoples of Canaan. "the Jebusite", offspring of Canaan. 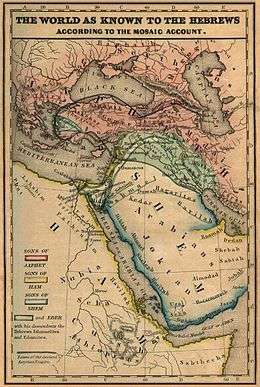 "the Amorite": Generic name for West Semitic peoples of the Fertile Crescent. "the Arkite", offspring of Canaan. "the Sinite", offspring of Canaan. "the Arvadite", offspring of Canaan. "the Zemarite", offspring of Canaan. "the Hamathite", offspring of Canaan. Elam: A kingdom east of Babylon and along the Persian Gulf. The Elamites called their land Haltamti and had an empire (capital Susa) in what is now Khuzistan, modern Iran. Elamite is not a Semitic language. Arpachshad: An obscure name of uncertain meaning, although apparently associated with northern Mesopotamia. Cainan is listed as the son of Arpachshad and father of Shelah in the Septuagint, a Greek translation of the Hebrew bible (the Masoretic text) made in the last few centuries before the modern era. The name is omitted in the Hebrew bible. The genealogy of Jesus in St. Luke 3:36, which is taken from the Septuagint rather than the Hebrew text, include the name. Salah (also transcribed Shelah) son of Arpachshad (or Cainan). Eber son of Shelah: The ancestor of Abraham and the Hebrews, he has a significant place as the 14th from Adam. Peleg: The name means "division," and may refer to the division of the peoples in the Tower of Babel incident which follows, or to Peleg and his descendants being "divided out" as the chosen people of God. Joktan: The name is Arabic, and his 13 "sons," so far as they can be identified, correspond to the west and southwest of the Arabian peninsula. Lud: The kingdom of Lydia in eastern Anatolia. However, Lydia was not Semitic and not geographically near the other "sons of Shem", which makes its presence in the list difficult to explain. An early Arabic work known as Kitab al-Magall "Book of Rolls" (part of Clementine literature) mentions Bouniter, the fourth son of Noah, born after the flood, who allegedly invented astronomy and instructed Nimrod. Variants of this story with often similar names for Noah's fourth son are also found in the c. fifth century Ge'ez work Conflict of Adam and Eve with Satan (Barvin), the c. sixth century Syriac book Cave of Treasures (Yonton), the seventh century Apocalypse of Pseudo-Methodius (Ionitus), the Syriac Book of the Bee 1221 (Yônatôn), the Hebrew Chronicles of Jerahmeel, c. 12th–14th century (Jonithes), and throughout Armenian apocryphal literature, where he is usually referred to as Maniton; as well as in works by Petrus Comestor c. 1160 (Jonithus), Godfrey of Viterbo 1185 (Ihonitus), Michael the Syrian 1196 (Maniton), Abu al-Makarim c. 1208 (Abu Naiţur); Jacob van Maerlant c. 1270 (Jonitus), and Abraham Zacuto 1504 (Yoniko). 1 2 Rogers 2000, p. 1271. ↑ Biblical Geography: "The ethnographical list in Genesis 10 is a valuable contribution to the knowledge of the old general geography of the East, and its importance can scarcely be overestimated." ↑ Blenkinsopp 2011, p. 156. ↑ Blenkinsopp 2011, p. 4,155–156. ↑ Towner 2001, p. 102. ↑ Gmirkin 2006, p. 140–141. ↑ Towner 2001, p. 101–102. ↑ Blenkinsopp 2011, p. 156–157. ↑ Brodie 2001, p. 186. ↑ Sadler 2009, p. 123. ↑ Scott 2005, p. 4. ↑ Alexander 1988, p. 102–103. ↑ Pietersma & Wright 2007, p. xiii. ↑ Scott 2005, p. 25. ↑ Strawn 2000a, p. 1205. ↑ Strawn 2000b, p. 543. ↑ Rogers 2000, p. 673. ↑ Blenkinsopp 2011, p. 158. ↑ Thompson 2014, p. 102. ↑ Gmirkin 2006, p. 147. 1 2 3 4 5 6 Towner 2001, p. 103. ↑ Bøe 2001, p. 48. 1 2 Gmirkin 2006, p. 149. ↑ Bøe 2001, p. 47–48. 1 2 Gmirkin 2006, p. 150. ↑ Gmirkin 2006, p. 150–152. ↑ Bøe 2001, p. 101. ↑ Bøe 2001, p. 102. ↑ Gmirkin 2006, p. 148. ↑ Gmirkin 2006, p. 149–150. ↑ Gmirkin 2006, p. 161. 1 2 Towner 2001, p. 104. ↑ Uehlinger 1999, p. 628. ↑ Matthews 1996, p. 452. ↑ Mathews 1996, p. 445. ↑ Mathews 1996, p. 445–446. ↑ Towner 2001, p. 104–105. 1 2 Towner 2001, p. 105. ↑ David Moshman (2005). "Theories of Self and Theories as Selves". In Cynthia Lightfoot, Michael Chandler and Chris Lalonde. Changing Conceptions of Psychological Life. Psychology Press. p. 186. ISBN 978-0805843361. 1 2 3 4 Gmirkin 2006, p. 141. 1 2 Gmirkin 2006, p. 142. ↑ Matthews 1996, p. 497. ↑ Matthews 1996, p. 38. ↑ Tooman 2011, p. 160. ↑ This was observed as early as 1734, in George Sale's Commentary on the Quran. Philip Alexander (1988). "Retelling the Old Testament". It is Written: Scripture Citing Scripture : Essays in Honour of Barnabas Lindars, SSF. CUP Archive. ISBN 9780521323475. Blenkinsopp, Joseph (2011). Creation, Un-creation, Re-creation: A Discursive Commentary on Genesis 1–11. A&C Black. ISBN 9780567372871. Bøe, Sverre (2001). Gog and Magog: Ezekiel 38–39 as pre-text for Revelation 19, 17–21 and 20, 7–10. Mohr Siebeck. ISBN 9783161475207. Brodie, Thomas L. (2001). Genesis As Dialogue : A Literary, Historical, and Theological Commentary. Oxford University Press. ISBN 9780198031642. Carr, David McLain (1996). Reading the Fractures of Genesis: Historical and Literary Approaches. Westminster John Knox Press. ISBN 9780664220716. Day, John (2014). "Noah's Drunkenness, the Curse of Canaan". In Baer,, David A.; Gordon, Robert P. Leshon Limmudim: Essays on the Language and Literature of the Hebrew Bible in Honour of A.A. Macintosh. A&C Black. ISBN 9780567308238. Gmirkin, Russell (2006). Berossus and Genesis, Manetho and Exodus: Hellenistic Histories and the Date of the Pentateuch. Bloomsbury Publishing USA. ISBN 9780567134394. Granerød, Gard (2010). 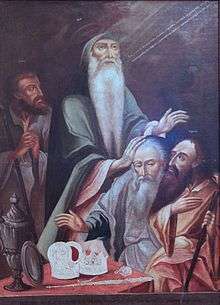 Abraham and Melchizedek. Walter de Gruyter. ISBN 9783110223453. Kaminski, Carol M. (1995). From Noah to Israel: Realization of the Primaeval Blessing After the Flood. A&C Black. ISBN 9780567539465. Keiser, Thomas A. (2013). Genesis 1–11: Its Literary Coherence and Theological Message. Wipf and Stock Publishers. ISBN 9781625640925. Knoppers, Gary (2003). "Shem, Ham and Japheth". In Graham, Matt Patrick; McKenzie, Steven L.; Knoppers, Gary N. The Chronicler as Theologian: Essays in Honor of Ralph W. Klein. A&C Black. ISBN 9780826466716. Daniel A. Machiela (2009). "A Comparative Commentary on the Earths Division". The Dead Sea Genesis Apocryphon: A New Text and Translation With Introduction and Special Treatment of Columns 13–17. BRILL. ISBN 9789004168145. Matthews, K.A. (1996). Genesis 1–11:26. B&H Publishing Group. ISBN 9781433675515. Pietersma, Albert; Wright, Benjamin G. (2005). A New English Translation of the Septuagint. Oxford University Press,. ISBN 9780199743971. Rogers, Jeffrey S. (2000). "Table of Nations". In Freedman, David Noel; Myers, Allen C. Eerdmans Dictionary of the Bible. Amsterdam University Press. ISBN 9789053565032. Jacques T. A. G. M. Ruiten (2000). Primaeval History Interpreted: The Rewriting of Genesis 1–11 in the Book of Jubilees. BRILL. ISBN 9789004116580. Sadler, Rodney Steven, Jr. (2009). Can a Cushite Change His Skin? : An Examination of Race, Ethnicity, and Othering in the Hebrew Bible. A&C Black. Scott, James M. (2005). 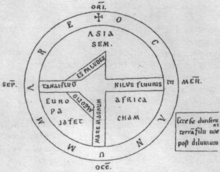 Geography in Early Judaism and Christianity: The Book of Jubilees. Cambridge University Press. Strawn, Brent A. (2000a). "Shem". In Freedman, David Noel; Myers, Allen C. Eerdmans Dictionary of the Bible. Amsterdam University Press. Strawn, Brent A. (2000b). "Ham". In Freedman, David Noel; Myers, Allen C. Eerdmans Dictionary of the Bible. Amsterdam University Press. Thompson, Thomas L. (2014). "Narrative reiteration and comparative literature: problems in defining dependency". In Thompson, Thomas L.; Wajdenbaum, Philippe. The Bible and Hellenism: Greek Influence on Jewish and Early Christian Literature. Routledge. Uehlinger, Christof (1999). "Nimrod". In Van der Toorn, Karel; Becking, Bob; Van der Horst, Pieter. Dictionary of deities and demons in the Bible. Brill. Wajdenbaum, Philippe (2014). Argonauts of the Desert: Structural Analysis of the Hebrew Bible. Routledge. 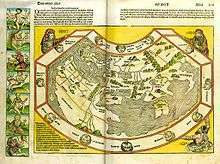 Jewish Encyclopedia: Entry for "Genealogy"
Custance, Arthur C., The Roots of the Nations. A more standard creationist account that associates Japheth with Europe.